Last Sunday a friend brought pumpkin chocolate chip cookies to a meeting I attended. They were delicious and they got me so excited for Fall and pumpkin treats! Since I'm ready to bring on Fall, I thought I'd share a favorite pumpkin bar recipe with you today. To make it extra cute I used my mini bundt cake pans and added Hershey bar stems. I got this idea from Pinterest last year but cannot find the link to my inspiration anywhere right now. Once I find it, I will add the link here. I didn't put frosting on my pumpkin shaped treats... but I'm thinking next time I will try that. Grease 9 x 13 inch baking pan. In a large bowl, combine all bar ingredients. Beat at low speed until moistened, then beat at medium speed until blended. Pour into greased pan and spread evenly. Bake at 350 degrees for 25 to 30 minutes, or until toothpick inserted in center comes out clean. Place all ingredients in a small bowl. Beat on high until smooth. Spread on cooled bars. If you make these, let me know how it goes. If you have a good pumpkin recipe, share the link or the recipe in the comments. PS- Our Kevin Henkes giveaway week is in session! Don't miss out! We are giving away a copy of Chester's Way. Don't forget to enter! 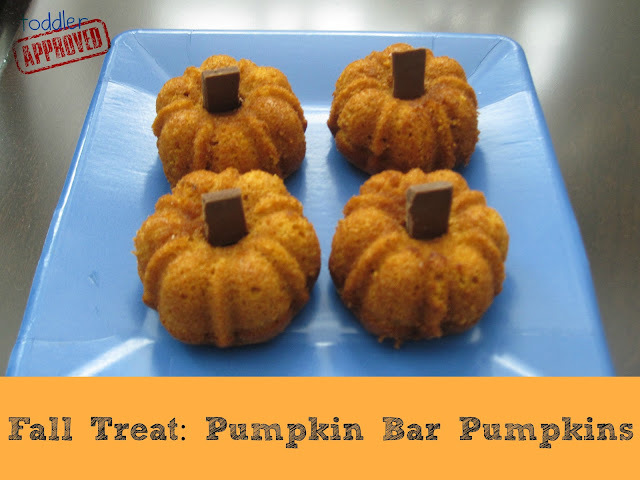 Those Pumpkin Bars are adorable! I love that you added the little chocolate stem. Our family loves having this Pumpkin Maple Coffee Cake every fall... it's a tradition... So yummy and makes the house smell so autumn-y. Thanks for providing such a wonderful website for us! Sift first 6 ingredients into a medium bowl. Combine butter, shortening and brown sugar in a large bowl and beat until fluffy. Add egg, molasses and orange peel, beat until blended. Add dry ingredients; mix just until incorporated. Cover and chill 1 hour. Preheat oven to 350°F. Grease 2 baking sheets. Place sugar in small bowl. Using wet hands, form dough into 24 equal balls. Roll in sugar to coat. Transfer to prepared baking sheets, spacing 2˝ apart. Bake 12–15 minutes. until golden and cracked on top but still soft. Cool 1 minute before transferring to rack to cool completely. To Make Sandwiches: Place 12 cookies on work surface flat side up. Top each with 1/3 cup ice cream. Spread to 1/4˝ from edge. Top each with second cookie, press to adhere. Freeze 2 hours. Keep frozen until serving. Yields 12 cookie sandwiches. Use pumpkin ice cream instead of vanilla. Yummiest fall treat ever!